President Trump has been in office for just 13 months, but his White House has already seen a number of high-profile departures. On Wednesday, communications director Hope Hicks became the latest member of the Trump administration to announce that she was leaving. Jan. 30, 2017: Mr. Trump fires Sally Yates as acting attorney general. Yates, an Obama appointee, had refused to enforce the first iteration of Mr. Trump's travel ban on persons from a number of Muslim-majority countries. Feb. 13, 2017: Mr. Trump fires National Security Adviser Mike Flynn. Flynn was a close adviser to Mr. Trump during the campaign, but he was forced out after he misled Vice President Mike Pence about the nature of a phone call with the Russian ambassador. Feb. 15, 2017: Labor Secretary nominee Andy Puzder withdraws after it becomes clear he would not have the votes for confirmation. March 2017: Assistant Communications Director Boris Epshteyn resigns. March 30, 2017: White House deputy chief of staff Katie Walsh steps down. April 5, 2017: White House chief strategist Steve Bannon is removed from the National Security Council's Principals Committee. April 8, 2017: K.T. McFarland removed as National Security Council's deputy director, to be nominated U.S. ambassador to Singapore. May 9, 2017: Mr. Trump fires FBI Director James Comey. May 30, 2017: Communications Directions Mike Dubke confirms that he is leaving the White House. July 28, 2017: Reince Priebus resigns as chief of staff, and is replaced by Gen. John Kelly. July 31, 2017: Mr. Trump removes Anthony Scaramucci as communications director. Scaramucci had spent only 10 days on the job. Aug. 4, 2017: Former press secretary Sean Spicer leaves the White House. Aug. 18, 2017: Steve Bannon leaves the White House and returns to Breitbart. He is later removed from Breitbart after criticizing Mr. Trump. Sept. 29, 2017: Secretary of Health and Human Services Tom Price resigns after he is accused of improperly using taxpayer funds for travel. Dec. 13, 2017: White House announces that presidential aide Omarosa Manigault-Newman will leave the administration after a dispute with Kelly. Officials later say that she was fired by Kelly, attempted to appeal directly to Mr. Trump, and was removed from the building. Feb. 2, 2018: The White House announces that K.T. McFarland has withdrawn her nomination as Ambassador to Singapore. McFarland had discussed Russia with Flynn during the presidential transition. Feb. 7, 2018: White House Staff Secretary Rob Porter resigns after it was revealed that he had been accused of physical abuse by two ex-wives. The scandal triggers a review of security clearance procedures in the White House. Feb. 9, 2018: Speechwriter David Sorenson resigns after being accused of spousal abuse. Sorenson denies the allegations and says he was the one who was abused. Feb. 14, 2018: National Economic Council adviser George David Banks resigns after being informed he will not receive a security clearance. Feb. 27, 2018: Josh Raffel, a spokesman for Jared Kushner and Ivanka Trump, confirms that he is leaving the White House sometime over the next two months. Feb. 28 2018: Hope Hicks announces that she will be stepping down as communications director. March 6, 2018: Top White House economic adviser Gary Cohn announces that he will resign. 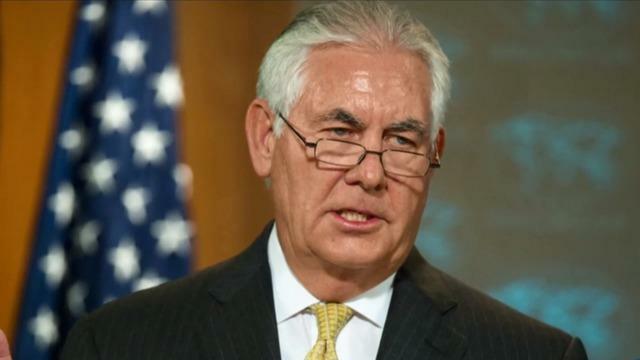 March 13, 2018: President Trump removes Secretary of State Rex Tillerson to be replaced by CIA Director Mike Pompeo, announcing the news via Twitter. March 13, 2018: Personal aide to the president John McEntee is fired after officials say he was under investigation by the Department of Homeland Security for financial crimes. March 22, 2018: President Trump announces that White House National Security Adviser H.R. McMaster will be replaced by former UN Ambassador John Bolton in a tweet. March 28, 2018: President Trump announces that he will replace Veterans Affairs Secretary David Shulkin and replace him with his nominee Adm. Ronny Jackson, who had been serving as the president's doctor. Jackson later would withdraw his nomination from the post over allegations on his behavior and work practices. April 10, 2018: White House Homeland Security Adviser Tom Bossert leaves his White House post with no formal reason given. The arrival of John Bolton as the new national security adviser triggered the decision to force Bossert out. CBS News' Mark Knoller contributed to this story.